Two disparate books again, although they’re both about places you go (a hotel, on the Tube, maybe??). Both of them are to do with occasions, too, as “Underground to Everywhere” was a LibraryThing Virago Group Secret Santa book from my friend Verity (yes, I know I skipped ahead of it in my reading order, but it was one I had to read in the house rather than out and about, as it’s a large hardback) and “The Hotel” was borrowed from my friend Ali, who took part in an Elizabeth Bowen Reading Week in a Facebook Group we both belong to (Undervalued Mid-20th Century British Women Writers) – her review is here and I came a little late to the party, as I didn’t have a copy of my own. And I enjoyed both of them, so there’s a win! I think Bowen might be better known for her novels about Ireland, and I certainly haven’t read her for a long while (she doesn’t appear in this blog apart from being mentioned as having a short story in a collection I read back in 2005), so I wasn’t sure what to expect, apart from having an idea that she might be a bit mannered and distant, like Elizabeth Taylor, maybe. In fact, this novel about English expats in a 1920s hotel abroad does have a slightly detached and Tayloresque air about it, although the shifting perspectives and zooms in and out make it sometimes feel like a more modernist and experimental novel. The book starts and finishes with the slightly touchy, difficult and very mid-century women writers-y relationship between two middle-aged, single women who seem to live permanently in the hotel and have a deep but somewhat troubled friendship. In between, we visit various types, from the groups of raucous girls to the professionally difficult Sydney, who has another odd relationship with an older woman, this time, Mrs Kerr. When Mrs Kerr’s son makes his intention to visit known, everyone perks up, but we also have a Church of England chappy who makes a bit of a blundering mess of things, and the stage is set for gossip over the bridge table, arch looks, stolen kisses and all sorts, all seen through a shifting lens of various characters’ eyes. It does come across as slightly a cold book, although I don’t mind that. You can kind of see the mind of the author moving the characters around and forcing them into confrontations with each other, exploring what love and marriage mean. It’s not a quick read, for all it’s a slender book: for one thing, the type is quite small, and for another, the sentences can get a bit complex (there are also a couple of typos, one of which threw me for a moment as it changes someone’s gender). There’s an air of menace which never quite gets resolved, and a feeling that the author is at the hotel, or has been at a similar one, coolly observing. PS Hooray – I just checked and this fills in another year in my Century of Reading, without trying at all! I have read quite a few books on the Underground recently, and I started to worry a little when I started this book and got the same story of the Metropolitan Line, Yerkes’ plans for the Tube, the fights between rival companies over the Circle Line and all that stuff. But never before have I been informed that Yerkes rhymes with turkeys, and it’s in its description of the war and inter-war years that this book really comes into its own, really picking up on the idea given in the subtitle that it’s about “London’s Underground railway in the life of the capital”. We learn lots of fascinating information alongside good illustrations and informative maps; for example about the methods they had for blocking off the sub-Thames tunnels in the event of a bomb striking the river and the use of stubs of tunnels for war work. I need to mention that Iris Murdoch’s novel “A Word Child” is mentioned in a box on p. 88, with reference to the bars that used to be open on the underground. Such little touches add a lot to the book, and, although it tails off a bit into committees and a small rant about under-investment, it’s a useful addition to the literature on the history of the tube, with much to recommend it. I don’t feel that I’ve read much this month; I’m not sure what’s happened really, although I was working on writing up my Iris Murdoch research at the beginning of the month in a failed attempt at doing Nanowrimo that I will blog about elsewhere in the fullness of time, but I haven’t acquired many books this month, either, so the TBR is still holding at a shelf and only a shelf. I’ll be getting on with the book I’m reviewing for Shiny New Books tomorrow, and I’m having a go around the charity shops to pick up some Secret Santa gifts tomorrow, too – the struggle there will be to resist temptation on my own behalf! I’m also looking forward to starting to re-read “The Forsyte Saga” along with a non-blogging friend and some other book bloggers, and starting to look at the Anthony Trollopes (I have them on e-book, but should I repurchase the print books, which I carefully deaccessioned a while back to save on shelf space?). I’m also going to have a month of re-reading in January, as I’ve been noticing reviews of lots of books I’ve read and loved on other people’s blogs, and am itching to make a lovely pile to wallow in! What are you reading as the winter closes in? Are you thinking of next year’s reading challenges or taking it as it comes? After last time’s totally disconnected books, today I have two that are all about words and language. Hooray! One’s an e-book and one’s a paper book, and I have no record at all about when I bought either of them, although I’m pretty sure that both date back to 2013 [update: I went on to Amazon to check the date of publication and discovered that Amazon has recorded when I bought it – hooray again!]. I work with words all day and I love thinking about and reading about them, too, so this has been a lovely bit of reading for me. This is a reference book all about how people’s first language affects their production of English – spoken and written. It takes a language or group of languages (so, French, Spanish, Portuguese, Scandinavian languages, West African languages) and goes through the ways in which the structure, grammar, pronunciation, gender division etc. in that language affects the speaker’s learning of English. Some languages are similar to ours, some seem to be similar but aren’t, and some are extremely dissimilar – if you want to understand what this book is about, you just have to think about how we native English speakers can grasp a lot of French because the structures and vocabulary are quite similar, but struggle to remember which gender particular words are supposed to have (because we don’t gender our nouns and French does), or with pronouncing the French ‘r’ sound (because we don’t have that sound in our language) or with the different endings to verbs (because we don’t tend to change verbs by speaker so much), or have trouble with Russian and Greek because we have to master new alphabets as well as words, or Arabic, because it has a different alphabet that reads right to left. The book is pretty comprehensive – it doesn’t cover all languages, unfortunately missing out Icelandic (which is a Scandinavian language but isn’t mentioned in that section) and Finnish (however, most Finns I have met speak and write almost perfect English, and this is primarily a book designed to help English language teachers to deal with the common problems experienced by language learners). Although each chapter is written by a different set of experts, the structure and the areas dealt with remain broadly the same, all covering the same areas of grammar, for example, and most containing lists of those fascinating and annoying things, ‘false friends’ (where a word that sounds the same in two languages means something different in each, for example ‘actuel’ and variants meaning ‘at that time’ rather than ‘actual’ in the “Actually, I’m going to the cinema, not the theatre” kind of sense). I got an awful lot out of this book, although I appreciate it wouldn’t be everyone’s fun-filled bedtime reading. I specialise in working with non-native speakers, so read a lot of texts created or translated by people whose English isn’t their first language, and I have long noticed the similarities between the English produced by my sets of Arabic, French, Chinese etc., speaking clients: now I can see exactly why they write in the way that they do, and how the structures of their languages affect the way in which they produce English. Fascinating stuff! This completes the 1987 entry for my Century of Reading! This book is based on an interesting concept: it looks at lost and interesting words in the English language, taking as its structural basis the hours of the day and night, so words about having trouble getting up in the morning, staying in bed, being warm under your duvet and getting dressed are grouped together into a narrative, while there’s a later section on lunch, office lunches, etc. and one on love lives in the evening section. This makes the material even more lively and interesting than it already is, and is an effective way to navigate the book, too. It’s written in a lively, amusing and accessible style with a great deal of dry wit and very funny asides. I’d read these words in a list, but the structure and themes serve to enhance rather than confine the writer’s style and subject. I have to admit to knowing some of the words in this book already, but then I would suspect that most people reading it would find the little thrill of “Oh, I knew that, ” which is engendered when you come across one that you recognise. A good read and I would actually go back and look up the word for this and that, as the author suggests (he warns against reading it cover to cover, but I found that fine – however, I’m the kind of person who reads the book reviewed above from cover to cover, too, so it might be more of a dipping-in book for other people. No acquisitions recently, as it’s present-buying season – unless you count a copy of a book I can’t mention because it’s on the wishlist of one of my Secret Santa giftees which arrived damaged in the post (yes, the vendor refunded me immediately, but sending a hardback book out in a thin plastic envelope doesn’t seem the best idea in the world – it arrived with a puncture through the wrapping and through the SPINE of the poor book, and I can’t give it as a gift now!). 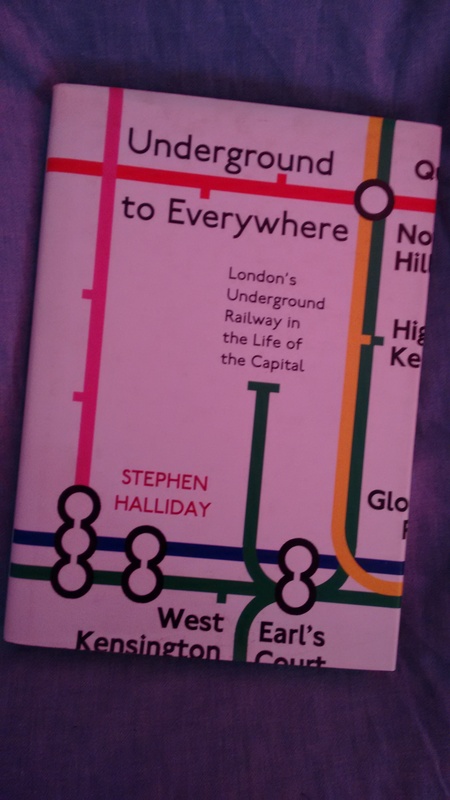 I’m currently reading “Underground to Everywhere, which is a lovely history of the London Underground within its context of London, and pondering what paperback to start next. What are you reading? Do you like reading books to do with your job, or would you rather leave that at the end of the day? OK, confession time. These books have SO LITTLE in common that nothing can make this post come out right. Except maybe it represents the wide range of my reading tastes? I even thought, “Oho, that’s OK, they’re both on my Century of Reading List. But that turns out to be a different Georgette Heyer novel. So all I can do is apologise to the one or two readers who have made it this far. Spoiler alert: I may have enjoyed one of these books more than the other. Yes, I bought this well over a year ago, during a lovely trip to Oxford. All of the other books I bought then are long read and shelved or passed along. And I did start this one at the “right” time, as in I picked it off the shelf as it came to the top and started to read it. What I can say is that I read all the words. I read Iris Murdoch’s novels a lot, and I love and understand them. But a philosopher I am not, and Murdoch with her philosopher hat on, writing about another novelist-philosopher, was always going to be a challenge. I think it was an online friend called Bill who mentioned casually that it was a work of literary criticism, really, and that helped to spur me on. But I have to admit to reading it rather mechanically, wishing that she’d put in some more commas to help the sense along, and feeling a bit lost. There was a chapter about the way language describes the world which talked about the post-structuralists (or maybe it was the structuralists) a bit, and I did understand that better at the time. Oh, where is the Liz who read the “History of Western Philosophy” and understood it all (at the time)? She was 17 and fresh-minded, I fear. Anyway, it was short, it’s been read, I’m keeping it in case I need to refer to it. I’m sorry, but it’s not left me with a burning desire to read Sartre’s novels which, frankly, sound rather terrifying. It does make me want to go back and check I still understand Iris Murdoch’s novelistic writing! Back from out of my depth and very much able to touch the bottom with my toe – but I wouldn’t call this shallow, as there’s a range of characters and motivations, sparkling wit, HUGE amounts of research worn lightly, and all the pleasures you’d expect from a vintage Heyer. It’s also one of the first books I wrote my married name in, as I bought it on our honeymoon in the Lake District (we had an exciting train journey from Windermere to Kendal, home of the mint cake and a shopping outlet mall). This one has one of the jolly and resourceful heroines Heyer does so well, throwing herself on the mercy of her cousin as she tries to escape the miserly ways of her guardian. There’s a batch of amusingly different cousins who all have to end up vying for her hand (one of them is pretty mentally challenged, but as he does prevail in the end, it’s not a cruel portrayal, but an affectionate one – I did worry at the beginning). High-society London is all it promises to be and more, but Kitty keeps her head, and control of her purse-strings. But will she realise that the cousin she first loved is perhaps not the best match for her? And can her fiance persuade himself that there is more to his moral fibre and courage than meets the eye? A lovely read, a good antidote to the rigours of philosophy! Only one acquisition to report – after all, it is coming up to Christmas (including three Secret Santas) and birthday season, and I don’t want to accidentally undermine someone’s kind purchase by snapping up stuff myself! We were at our friend Bridget’s house at the weekend – unfortunately she’s developed an eye condition (she blogs about visual impairment over at A New Look Through Old Eyes) and isn’t able to read her cherished Persephones any more (she does do well with audio books and the text expansion capabilities of the iPad), and she kindly offered me one to add to my collection. 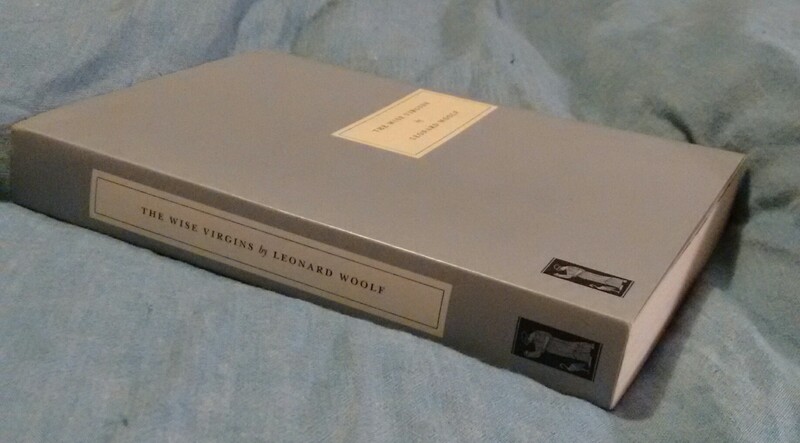 As we had a large overlap, I was thrilled to find Leonard Woolf’s “The Wise Virgins” and bring it home with me – thank you again, Bridget! This is also handy in being published in 1914, just in case I find my current Reading a Century book for that year a bit much. Have you stepped out of your comfort zone or your depth in your reading recently? Was it a good or alarming experience? Is it a good idea to shake things up with a bit of a challenge now and then? Does that in fact make returning to the familiar that bit better …? Well, here’s the TBR, and that’s not doing too badly, is it? 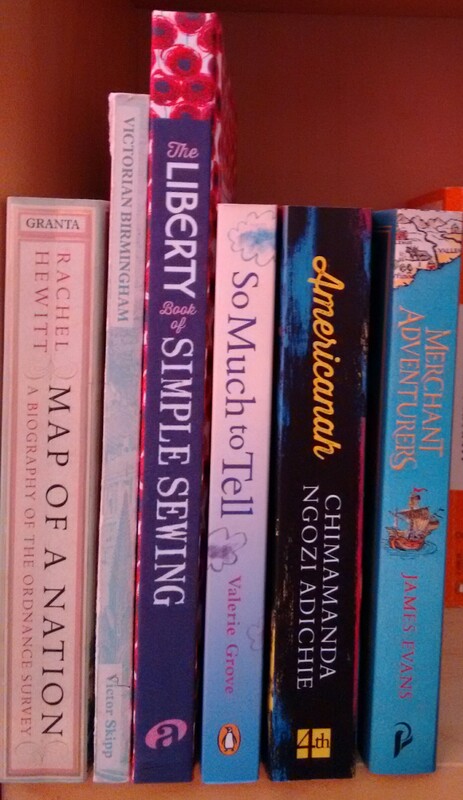 I have a little gap which should include two sewing books I’ve loaned to a friend, but it’s all one on shelf! However … I did only manage to finish 6 books in October (and one on 1 November) and I do have a fairly substantial TBR on my Kindle, too. The Kindle TBR does look lower than last time, although I have moved some books into the “Read” category that I had forgotten to move before. 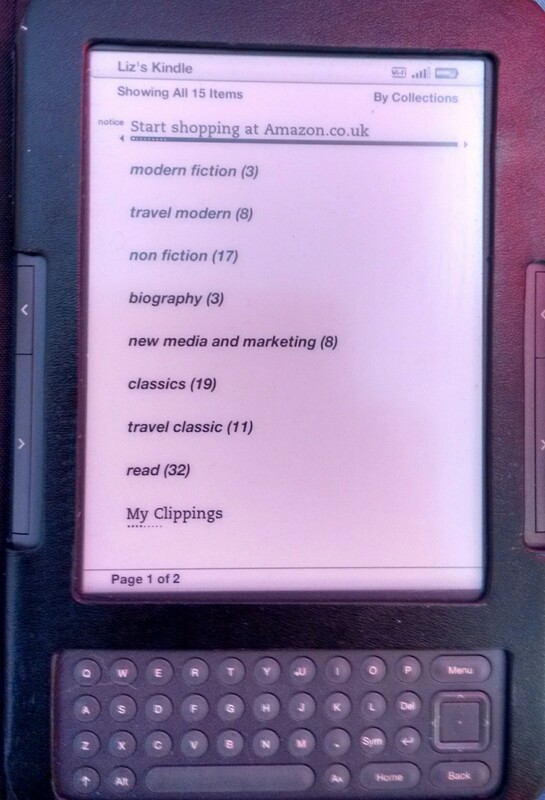 It’s a start, though, and it’s not actually bigger, at least … By the way, I’ve become a little jealous of certain friends’ smaller Kindles with their no keyboard (I have only ever used the keyboard on this one once! ), touch screens and snazzy cases. But I am mean, so I’m waiting until this one wears out before I go for an upgrade. Excitingly, on here is the complete Anthony Trollope, and I am planning on reading the Barchester Chronicles, one a month, starting next January (I’m also going to re-do Galsworthy’s “Forsyte Saga”, 2 months on, one month off, through the year, along with Heaven-Ali). If anyone fancies joining in with these challenges, please do pipe up! After my panicky post about being stuck in the middle of a massive book, you’d think I would have mended my ways and be reading fewer books concurrently. However, this is not so. Oh dear! As well as the Georgette Heyer which I recently finished and will be reviewed soon, I’m reading four other books – three in print and one e-book. 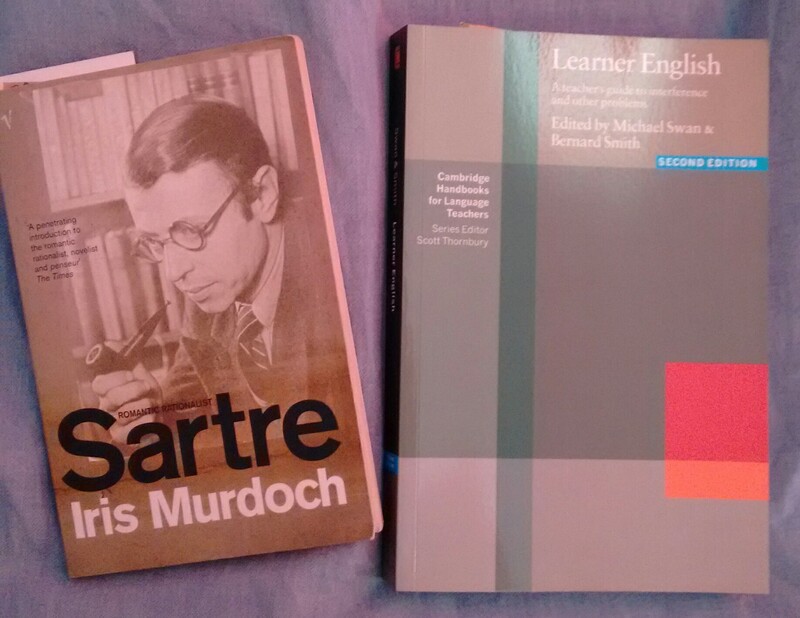 I’m actually getting on OK with the Sartre book by Iris Murdoch – I’m more than half way through and I certainly understood the chapter on language and am getting something out of it. “Learner English” is fantastic: it’s all about how people’s first language ‘bleeds’ into and affects their production of English. It goes chapter by chapter through the major world language groups, and certainly a) backs up some things that I’ve guessed about those languages and b) is teaching me a great deal about how other languages are constructed. Fascinating stuff indeed! I’ve also started “Underground to Everywhere”, which my friend Verity gave me for my Secret Santa Christmas present last year; that’s fascinating stuff, too, with so much detail in the text and side bars, and illustrations such as maps and posters. All good stuff and feeds my strong liking for transport-themed books. 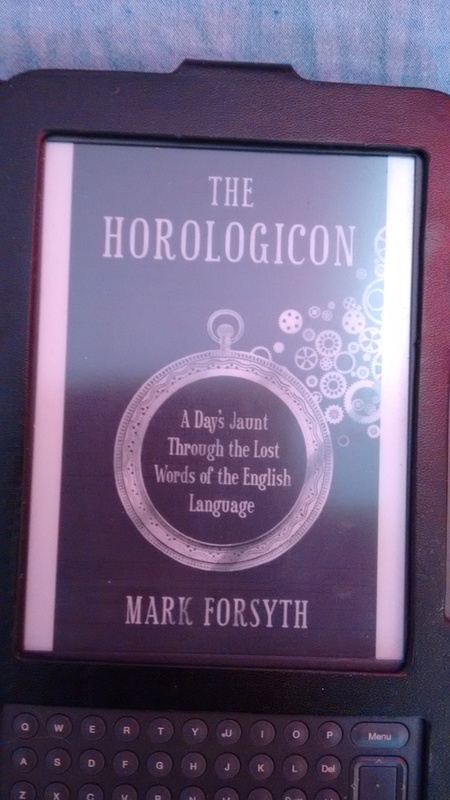 On the Kindle, I’m reading “The Horologicon” by Mark Forsyth, which was a cheapy offer on Amazon a little while ago. It’s a compendium of interesting and little-known words, based around the time of day at which they’re used, so you have all the words for having a lie-in or a hangover together, etc. It makes for a lively and interesting read, although I have heard of a few of the words so far, so they can’t be THAT obscure. It’s a good book to dip into, so having it on the Kindle is perfect for those little blocks of time. So, these will take me a while to get through, especially as I’m using NaNoWriMo (national Novel Writing Month) to work up my research notes on Iris Murdoch into something in writing, at least. I’m not sure whether my book will be shorter than the 50,000 words NaNoWriMo helps you to produce, but I know that I wouldn’t normally spend Saturday morning writing up my notes on books about book groups, so it must be having some effect. I hope it doesn’t clash with my reading time too much, however. Anyway, if I do manage to get to them, here are the next books on my TBR. I have an interesting-looking history of the Ordnance Survey (it has very small print, so I’m glad that I’ve got my new glasses sorted out); a book on the history of Birmingham, Liberty’s excellent how-to-sew book, the biography of Puffin editor Kaye Webb, and the novel “Americanah” which our friend Bridget gave us for a wedding present and I’ve been desperate to read for some time. The last book in that little lot is the non-fiction book on exploration I’ll be reviewing for the first 2015 edition of the Shiny New Books newsletter. Exciting! What are you reading? Are you formulating any reaching challenges for 2015? I’d love to hear about them!